This site is part of the TXGenWeb and USGenWeb projects dedicated to the genealogy and history of Glasscock County, Texas. GLASSCOCK, GEORGE WASHINGTON (1810–1868). 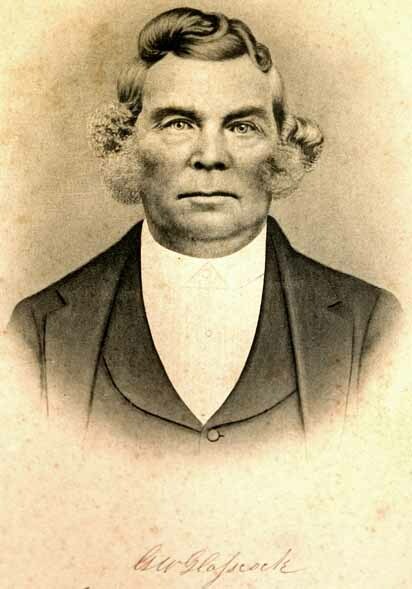 George Washington Glasscock, early settler, legislator, and businessman, was born in Hardin County, Kentucky, on April 11, 1810, the son of John (or Thomas) and Jane (Milligan) Glasscock. In 1830 he went to St. Louis, Missouri, and from there to Springfield, Illinois, where in 1832 he was in partnership with Abraham Lincoln in flatboating on the Sangamon River. He also fought in the Black Hawk War in Illinois. In September 1835 he moved to Texas and settled first at Zavala, Jasper Municipality, where he was in business with Thomas B. Huling and Henry W. Millard. Glasscock was with James Chesshire’s company in the Grass Fight and the siege of Bexar. In 1840 he and his wife, the former Cynthia C. Knight, moved to Bastrop County. In 1844 they moved to Travis County and in 1846 to the Williamson County area, where Glasscock helped to organize the county and donated 172 acres for the county seat, Georgetown, which was named for him. The Glasscocks had ten children. In 1853 he returned to Travis County. He represented Travis and Williamson counties in the Tenth and Eleventh legislatures and was one of the managers of the Lunatic Asylum (later Austin State Hospitalqv) during the gubernatorial administrations of Sam Houston, Edward Clark, Francis R. Lubbock, and Pendleton Murrah. As a result of his interest in wheat growing, Glasscock built the first flour mill in what was then western Texas. He was a Mason and an early member of the First Baptist Church in Austin. He continued to make his home in Austin until his death there on February 28, 1868. Glasscock County, established by the Texas legislature in 1887, was named in his honor. John Henry Brown, Indian Wars and Pioneers of Texas (Austin: Daniell, 1880; reprod., Easley, South Carolina: Southern Historical Press, 1978). Vertical Files, Dolph Briscoe Center for American History, University of Texas at Austin.